Chloe never knew that her father, a stern accountant who is continuously disappointed in his daughter and her life choices, is none other than the Hangman, the deadliest Wolf-Kind hunter of his generation. Chloe just wants to make her own choices in life, but all control is taken from her when William kidnaps her. She puts up a fight at every turn, but eventually finds out why she was chosen. When she learns that her father killed William’s father and Alpha of the Pack, her feelings towards William as a kidnapper soften. When he is gentle and cares for her well-being, Chloe begins to see things from his perspective and to see him for the strong protector type he really is. I couldn’t put this book down. AJ Downey’s books are so tense and exciting that it is hard to stop reading them. I’m eagerly awaiting the second and third books in this series. There were parts, granted, that delved into the annoying tropes of paranormal/romance books, but I almost didn’t care because I was so enthralled with what was going on and how the characters were interacting. I wanted to know what was going to happen next. AJ Downey and Ryan Kells delve upon the surface of something fascinating: discrimination and pure hatred of wolf-kind/hybrid. This is a concept that makes the easy-read paranormal/romance into a deeper book. “As reviled as he was, I was my father’s daughter in some of the more important ways. The ones that really counted. Having a backbone was one of those ways. I was also my mother’s daughter. Even though she’d died when I was young, she’d taught me understanding. To look beyond the surface. Past the color of people’s skin, past their clothes or where they lived or how they were raised.” (Kindle locations 3777-3781). Downey and Kells also go just deep enough into Pack politics and the biological particulars to build a world that I’m interested in. 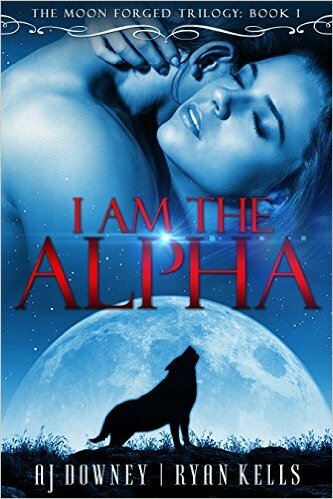 I’m not usually interested in paranormal, though Downey has shown me the better side of romance novels, but I Am the Alpha has more going on than most novels. Chloe has the right amount of stubbornness and she continuously, at first, fights back even against an insurmountable foe as William. She has spit and fire within her and doesn’t give up until she has completely exhausted all possibilities for escape. Toward the end of the novel, though, she gets even stronger and more stubborn in her convictions. William is a good balance between gentle, sympathetic man to jerk captor wolf-kind. He is the character I most liked. This novel was published by Second Circle Press on August 4th, 2015 and is available on Amazon here.